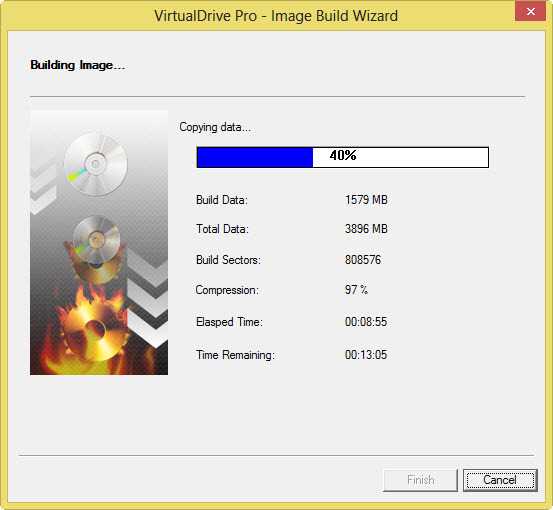 VirtualDrive Pro offers comprehensive set of features to lets you create an image of any physical disks and thereafter, allows you to burn it on the other physical disks. Whereas, a copy of disc image (Virtual CD) will be stored on the local storage drive. Besides creating or burning images, this tool also offers user to clone physical disks so as they might able to get back data when discs got corrupted, damaged or somehow lost. VirtualDrive Pro from FARSTONE offers easy to use and simple GUI based screen where all the options will be clearly listed and give you a clear glimpse of how to perform any desired actions. As soon as you open the software (by double clicking on the desktop screen), a pop up box will open through which, you can create virtual CD/DVD or BD from physical disc. To further customize the imaging process, 'Advanced Settings' option will be listed right before the 'Start' button. Through advanced settings, you can choose protection type (to protect the created image), assign author name, set passwords for VCD (virtual CD), choose compression type etc. Once you've done with the advanced settings, click on save and then click on Start button to finally start with the creating disc image process. Software will begin building image for any inserted optical disc. Level of compression, build data, total data and various other details are visible at the progress bar screen. At the software home screen, you could find various options to create, burn or clone Virutal Drive. In the same locations of software menu’s, you could also find options to add, delete, 'insert' virtual CD into virtal drive, search or view files in explorer like window. Using 'Burn' option, you can burn image into physical discs, burn a custom disc, or burn audio/MP3/CD from a project. 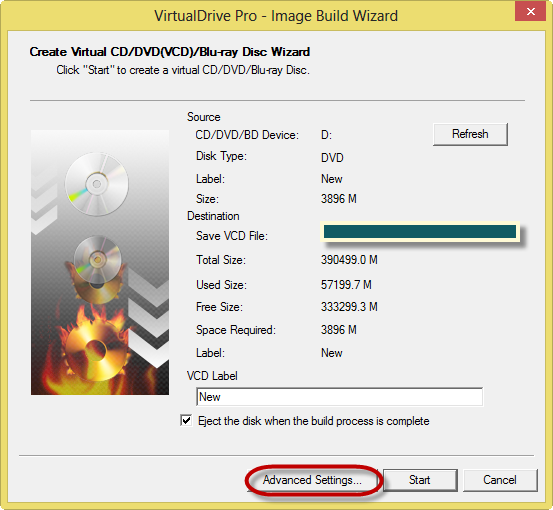 The software offers pretty fast and easy ways to create virtual images of any optical drives that you won’t always want to insert and then watch movies, play games or use programs. At the cost of $ 44.95, you can avail a single license and enjoy the great features of this software. Found it is very useful. Virtualdrive is an useful software.